This figure, however, has the shortcoming of not clearly depicting the partition of unity property. a baseline (regular) corner is located outside the enriched zone. These are beyond the particles marked with triangles. an enriched corner is located on the interior of the enriched zone. These are marked with star symbols. a transition corner is on the boundary between the enriched and non-enriched zones. These are marked with triangles. A non-enriched particle is located outside the enrichment zone. 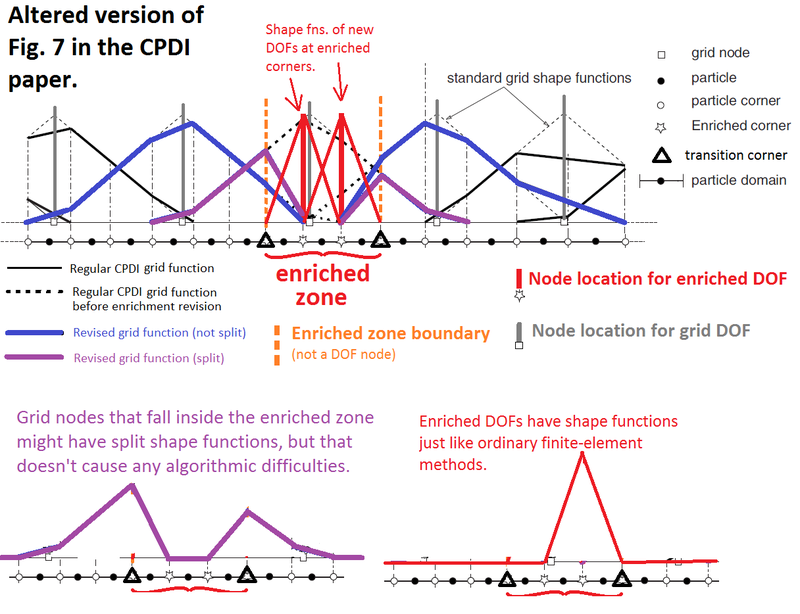 The basis functions over those particle domains look exactly as they would for an ordinary CPDI implementation, and they are handled the same as in a regular CPDI implementation. A fully enriched particle is located entirely inside the enriched zone and has only enriched corners. This particle affects only the enriched DOFs associated with its own corners. The calculation of the average of the shape function and its gradient over the particle domain proceeds the same as in the regular CPDI implementation, but with the sampled shape function values at the corners being the usual Kronecker deltas. A transition particle is located inside the enriched zone, but with at least one transition corner. These particles affect both ordinary grid nodes and enriched nodes. The ordinary grid contribution is handled similarly to a regular CPDI implementation except that the sampling of the standard grid shape functions is replaced with zero on the enriched corners. The contribution of the particle to the enriched DOFs is the same as it would be for a fully enriched particle. This entry was posted in Projects, Publications, Research, Software, Supplements and tagged CPDI2. Bookmark the permalink.